Sonoma, CA - February, 2004 - 4TEK is pleased to announce that in November, the Kreepster won the People's Choice Best New Product of 2003 Award at the 40th Annual Specialty Equipment Marketing Association (SEMA) Show in Las Vegas, NV, out of over 1,000 entries. SEMA is an international, trade-only show and convention for everything automotive. The SEMA award takes its place next to the Street Rod Marketing Association (SRMA) People's Choice Award won by the Kreepster in February of 2003. The Kreepster was also awarded the 2003 Product Innovation Award from Auto Trim & Restyling News in December: "This product is hereby recognized as an example of what is possible when aftermarket manufacturers successfully apply their design abilities." The publication has been serving the trim and restyling market since 1951. 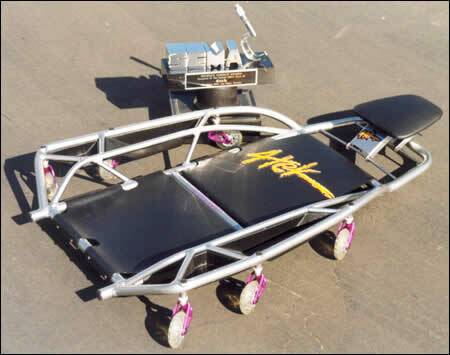 The Kreepster is an upgrade of the traditional mechanic's creeper, and includes features such as an adjustable headrest, tool holders, in-line skate wheels, and a lightweight aluminum tube frame. It is the first release in the forthcoming line of mechanic's convenience tools by 4TEK. The Kreepster is currently available from 4tek LLC at www.kreepster.com, or by phone at 707.996.3918. The Kreepster will soon be available through many retail locations, websites and catalogs, as well as through a direct response television advertisement. Kreepster is a registered trademark of 4tek LLC in the United States and/or other countries.